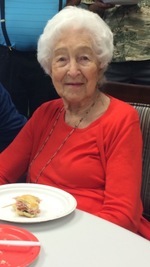 Uhlenkamp, Margaret J., age 102, of Eden Prairie formerly of Marshall, MN passed away peacefully September 9, 2018. Preceded in death by her sisters Irene Prokosch, Mildred Brosch, Helen Kenney, Leona Sturm, Ann Hughes and brother Fran Uhlenkamp. Survived by many nieces and nephews. Mass of Christian Burial 11 AM Thursday (9/13) at St. Hubert Catholic Community, 8201 Main Street, Chanhassen, with visitation starting at 10:30 AM. Interment St. Catherine Cemetery, Redwood Falls.